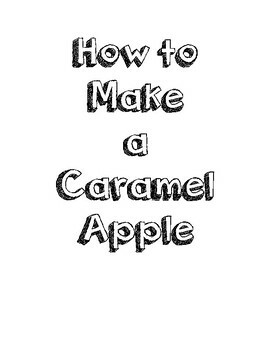 Students will make a caramel apple with the direction of the teacher. 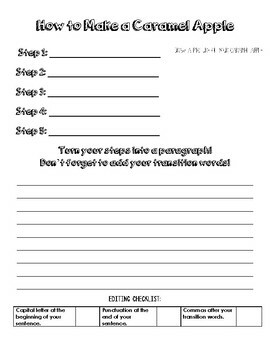 Students will complete a step, and then write it down. When the steps are complete, students can enjoy the remainder of their apple slices while turning their steps into a paragraph and adding transition words. 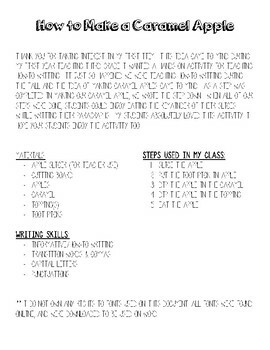 After the paragraph is complete, students can use the editing checklist to check their punctuation, capital letters, and commas after transition words. They can also draw a picture of what their caramel apple looked like. **It is recommended teacher slices the apples and then gives out apple slices.